the trees were full of the singing of goldfinches too! Two Films about Poets in just Two Days! I'm not sure whether it was a good idea by the Filmhouse to screen A Quiet Passion and Neruda so closely together - the potential audiences for the two films must be very similar and some people may have had to miss one of the films, which would be a shame as they're both worth seeing. Luckily I was able to see them both! Yesterday, I saw A Quiet Passion, a biopic of Emily Dickinson. It is really a series of scenes from her life, rather than having a structured narrative to it. The viewer sees Emily's relationship with her parents and siblings, her close friend Vyrling and her struggles against both what she considers an overbearing church and a painful illness. I found it interesting to have these insights into the poet's life, and enjoyed the voice-overs of her poetry, but the style of the film was far too mannered for me and the witty dialogue, though entertaining didn't seem convincing. I also found that although her illnesses and social awkwardness should have made Dickinson a sympathetic (though difficult character) I just found her very unsympathetic. Neruda (which I saw today) is a totally different film. Ostensibly based on Pablo Neruda's political difficulties (he was a communist politician in Chile as well as a significant poet) the film is very fictionalised, concentrating on an invented police officer almost as much as on Neruda himself. The story follows Neruda having to leave his home due to political difficulties and him being chased by said police officer. Thus ensues a game of cat and mouse which is absurd and entertaining. There is also, behind the story itself another, very clever, layer to the film that only becomes obvious as the film progresses. This film is dreamlike, with odd colour tones giving some scenes a feel of faded memories. Neither film should be seen as honest, real life accounts of the lives of their subjects. But then neither of them claim to be straightforward biopics (in fact Neruda has been described as an anti-biopic) and they offer a degree of insight into the creative process of two influential poets. 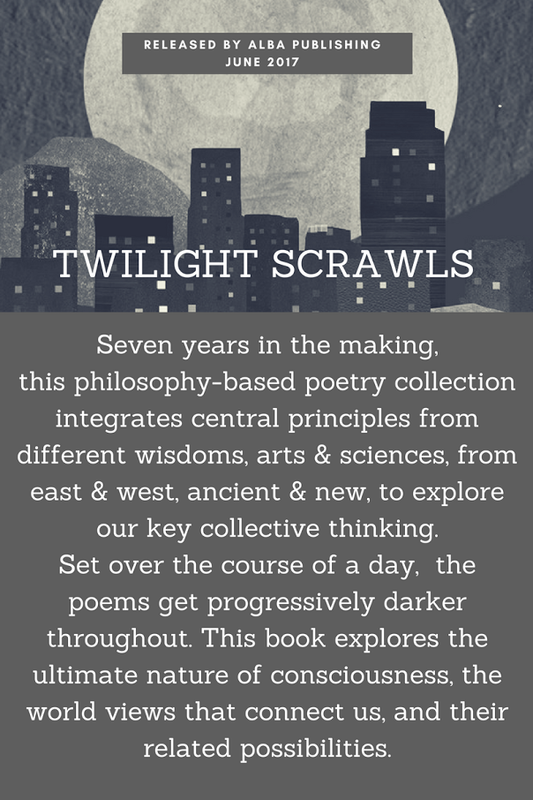 Twilight Scrawls is a collection of philosophy-based poems from Kirstin Maguire (with illustrations from Liam Ward). The book is made up of three sections, starting ‘at sunrise’, and moving through through the course of a day (and equally perhaps a lifetime) to ‘sunset’, then into the ‘night’. Themes covered include creativity, fate, consciousness, our relationship with nature and essentially what it means to be human, taking in ideas from various branches of philosophy. The Twilight in the title refers both to dusk and dawn and to a time and feeling of uncertainty. Feel frivolous furnace where once was shame. I don’t know how many times I’ve been blinded by its familiarity. And suddenly, its blossom, as if for the first time, I see. The sands of time, how they shift. Indeed each grows, crests, then flows away. Of all those swift goodbyes. They play their games and make their tricks. There just ain’t no use for politics. The poems become increasingly dark as the collection proceeds, it's a trajectory that makes logical sense but may be disheartening for some readers. Yes it feels as though the world is getting darker all the time, given the current political situations and the worsening state of the natural environment, but a journey into hope would be welcome! Some readers may feel the collection is too heavily weighted with philosophy, but in general it's a thought provoking read. 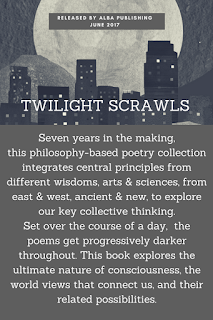 Twilight Scrawls by Kirstin Maguire published by Alba Publishing. Disclaimer: I received a free, electronic copy of this book. There were loads of butterflies enjoying the sunshine, though not stopped for a photo! We saw several orange tip butterflies, two peacock butterflies and two speckled wood butterflies. I have lots of lovely sea glass and sea pottery at the moment! I've donated some of the sea pottery to Gorgie City Farm and the Lochend Secret Garden for their garden mosaic projects and I have lots of ideas for using the sea pottery in various crafting projects. The middle bottle isn't full as a piece of sea glass has lodged and stuck in the neck of the bottle! All three of them though make pretty decorative features. I like the variety of the colours of sea glass in here. Earlier I had used some sea glass to make a pretty candle holder, which you can see here. and they're now in the Crafty Green Poet Etsy shop here. I made them from chain from a damaged vintage necklace along with brand new nickel free earring hooks. which as you may be able to tell are made from parts from the same original piece of jewellery, with the round charm in the necklace coming from a second original item. The earring hooks are of course brand new. I'll be adding more similar earrings to the shop in the near future so watch this space! I've also made some new chopstick bags recently, including this one made from a lovely orange satin that doesn't look as nice in the photos as it is in real life! (you can find it in the shop here). Wood sorrel is a lovely flower of early Spring, it's an indicator of ancient woodland. Ancient woodland is defined as land that has been continuously wooded since 1600 or earlier (in England. Wales and Northern Ireland) or since at least 1750 in Scotland. These plants are growing on a mossy wall in Colinton Dell, along the Water of Leith which is an area of ancient woodland. This area isn't entirely natural ancient woodland as some of the trees (particularly the hornbeams) were planted for use in the construction of the mills that used to line these riverbanks and other trees were planted as ornamentals by the country estates that also used to own much of these lands. Along the River to a Teddy Bears' Picnic! and teddy bears have been hidden around the gardens in preparation for the teddy bear hunt which is part of this afternoon's Easter Eggstravaganza. Saughton Park will close for a few months soon as it is going to be upgraded, the old buildings that used to be used as stables are going to be brought back into use and a new cafe created. You can read more in my blogpost from a few weeks ago. We'll need to go back in a few weeks to see the cherry trees in full bloom, it's one of the seasonal sights of Edinburgh. You can see the trees in full bloom a few years ago here. Lovely to see these beautiful rhododendrons in bloom in Princes Street Gardens this lunchtime! Also yesterday, I went to an excellent talk at the National Library of Scotland on 'from commonplace books to Facebook' which I reviewed here.